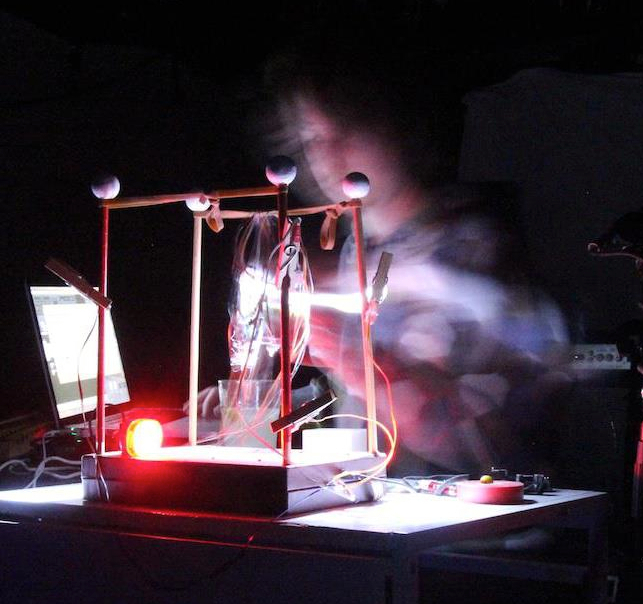 Leafcutter John will perform at the Music Lunchtime Recital Concert a piece called “Playing with Light” - a light controlled electronic music performance. After the performance he will give a short talk about his work and the hardware and software he has built do to perform his live electronic music. From the Light controlled music system to the equipment he uses with his twice Mercury Prize nominated Polar Bear. Questions are welcome at any point during the talk. John Burton originally studied Painting at Norwich School of Art and Design. He graduated in 1998 and moved to London and began exploring the possibilities of recording and manipulating sound on an old computer he originally bought to write his Art School dissertation. His first recordings reached the offices of Planet Mu Records in 1999 where its founder and Aphex Twin collaborator Mike Paradinas encouraged John’s more experimental efforts. Working with Planet Mu, John released 3 critically acclaimed albums which culminated in the release of The Housebound Spirit, an album which combined elements of music-concrete and electro-acoustic music with voice and guitar work more commonly found in folk music. It won an Honorary Mention at the 2004 Ars Electronica Awards, and was featured in The Wire Magazine’s Top 50 records of 2003. May 2015 will see the release of Resurrection (John’s 6th studio album) and marks fifteen years of releases by Leafcutter John. Aerial photographs of the Japanese tsunami of 2011 were a direct inspiration for the record. Not content with the usual tools available to the electronic musician, John has created innovative new systems and techniques for both live performance and production. This includes a light-controlled instrument that allows him manipulate his live sound through gesture, flickering candles, flashing torches and pyrotechnics. For the track “Gulps,” John coded special software to layer huge swathes of sound. Using a recursive system, he created 7.1 billion layers of a recording of the North Sea, one for each human alive on the planet at the time of writing. John has toured from Vietnam to Venice, appeared live with Beck Hansen and Imogen Heap, and provided the score for Crow, a major theatre project by Handspring (creators of War Horse). During this time, John has also maintained his permanent role as the unpredictable, electronic antagonist in Polar Bear, the twice Mercury Music Prize-nominated, genre-defying jazz band. He has also worked with Talvin Singh, Wayne Mcgregor’s Random Dance, BBC Symphony and Concert orchestras, and has played concerts worldwide with Beck, Jarvis Cocker, Imogen Heap, Matmos, Grace Jones, Nick Cave, Yo La Tengo, Beth Orton, Otomo Yoshihide, Aki Onda, Phillip Jeck, Tujiko Noriko Sebastian Rochford, and Janek Schaefer. Tunis (2010) Tsuku Boshi Records CD.